As I sit here and write this it is February. It is cold, grey, and dirty outside and the winter seems utterly endless. Yes, I know you are reading this in May and those freezing, rotten days seem like they were a lifetime ago. You see, February is usually when I head down to the tropics, but this year I did not go. Woe is me. Instead, I am getting my tropic fix sitting at my desk looking through supply lists from our producers. I am bringing the tropics here in the form of palm trees. We brought in 8 different varieties that are up to 8 feet tall. One of them is ‘Bismark Silver Palm’ which reminds me of Jurassic Park and dinosaurs. This variety as well as another, ‘King Sago’, has been around for the past 200 million years. What a history?! In addition to the palm trees, we have ‘Siam Ruby’ banana trees, ‘Birds of Paradise’, Mandevilla Vines which are 5 feet tall in a teepee form, ground orchids, and that is just the tip of the iceberg (winter joke). Using combinations of these plants in containers and planted in beds will give a look that I would have loved to see this winter. Since a little tropical vacation was not in the cards this year then I have brought the tropics to Indiana. Now, what did I do with my margarita and by golly turn up the Jimmy Buffett! Confers (aka evergreens) are the ultimate four-season plant and the backbone of gardens. From cute, miniature pines to stately spruces, conifers come in all shapes, sizes, colors, and textures. Conifers are easy to grow if you choose the right plant for the right spot. The first thing to consider is size. You need to pick a conifer that will highlight the scale of your garden. A large conifer will quickly overwhelm a small garden, while a dwarf will be lost in a large space. The growing habit of a particular variety is very important. Some conifers grow glacially slow while others grow several inches to over a foot a year. 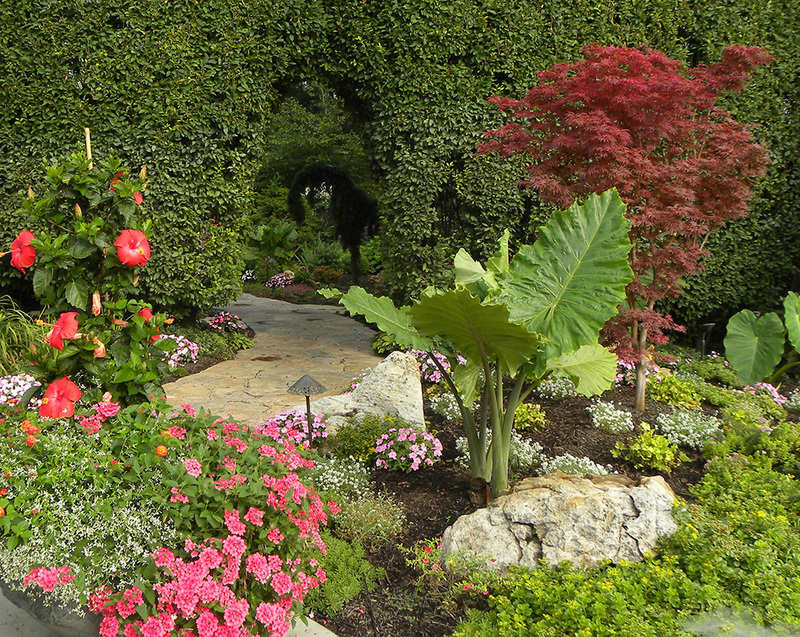 A specimen conifer will anchor a bed in winter and serve as a perfect backdrop to perennials in summer. We are always looking through our vast collection of rare and unusual specimens to choose exactly the right plant for a design. Even for us professionals find it challenging to identify a perfect fit, but the hunt is half the fun. When was the last time you had your feet in the sand on a tropical beach? Remember the salty sweet ocean air, the warm breeze, and, of course, the palm trees. Those memories don’t have to be limited to spring break and family vacations. 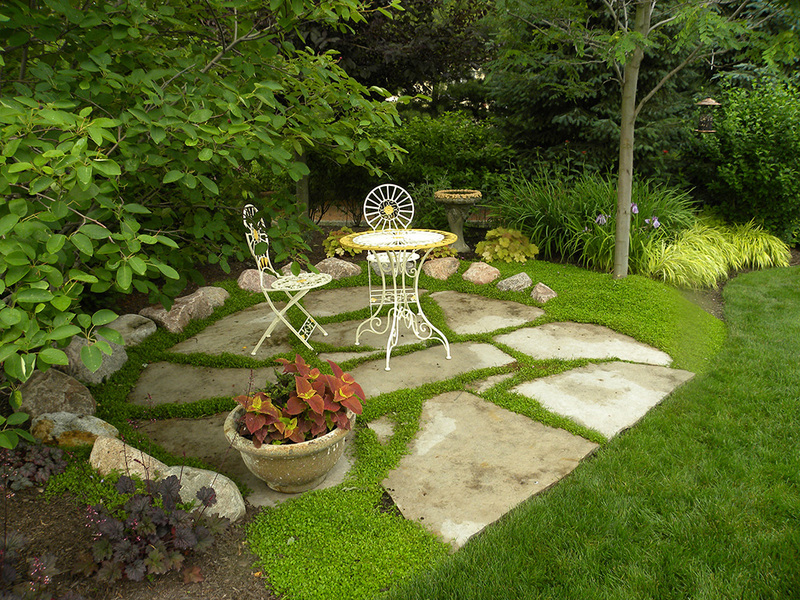 You can bring that peaceful, tropical feeling to your own home and garden even here in the Midwest. Elephant ears can help achieve that feeling in many forms. Colocasia (Taro Plant) is one of the oldest cultivated plants in the world, grown for more than 10,000 years. While we use them as a tropical accent in landscaping, they are most commonly grown as food. These plants produce long-stalked, heart shaped clumps that can tower up to 7 feet. They come in varied shades of green and even black leaves. They can be added to a landscape as a contrast or a centerpiece in a container. Boasting many showy flowers, Mandevilla vines can climb over 20 feet and are great in containers and hanging baskets. Tropical hibiscus, with their extremely large blooms, give the appearance of a tropical island and they come in many colors. Of course, no tropical look would be complete without palm trees and banana trees. They affect more than the sense of sight. Their fronds rustling in the summer breeze can take you far from home in an instant. The tropics are closer than you think. Just walk outside! For drawing the center of attention from their beautiful structure in our winter landscape, the mind-blowing diversity of leaf shapes and vivid fall colors, nothing beats Japanese Maples. Whether you need a striking focal point to give your garden that extra wow factor or an anchor for your perennials and especially if you are pondering a treasure for a Japanese themed garden, look no further. Japanese Maples are unrivaled for textural elegance, architectural presence, changing foliage, and autumn brilliance. Japanese Maples have a long history dating back over 400 years in Japan. The first examples arrived in Europe around 1820 and later to America. Over the centuries over 1000 different varieties have been cultivated with names like Lion Head, Sieryu, Crimson Queen and Bloodgood just to name a few. The variations between varietals are astonishing. Some have leaves thin, thread-like leaves while other’s leaves are almost round. Colors range from various shades of green to purples and reds. Variegated (multiple colored leaves) varietals are also available. 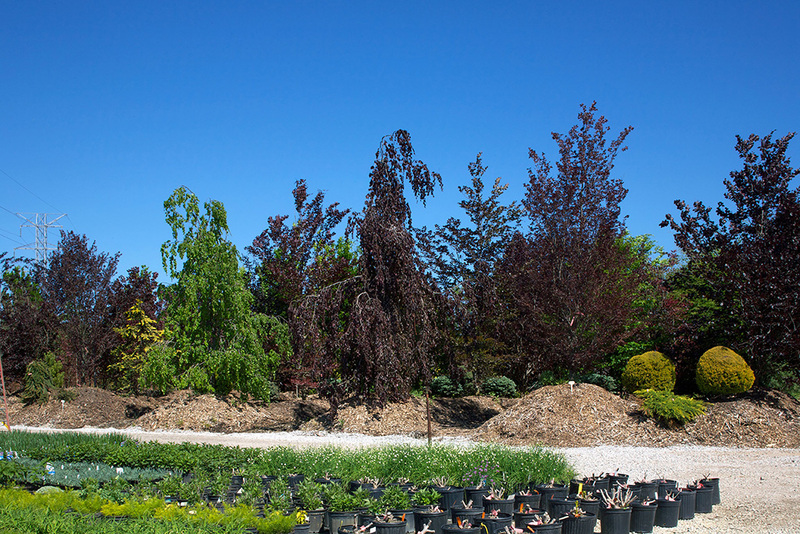 Today’s growers are still developing new Maples. One of our growers shared a story of how three specimens he created were dug up and stolen from his garden!